There are 5 posts tagged surveillance (this is page 1 of 1). [Wherever] information gathers and flows, two predators follow closely behind it: censorship and surveillance. The case of digital money is no exception. Where money becomes a series of signals, it can be censored; where money becomes information, it will inform on you. [..] A cashless society promises a world of limitation, control, and surveillance—all of which the poorest Americans already have in abundance, of course. For the most vulnerable, the cashless society offers nothing substantively new, it only extends the reach of the existing paternal bureaucratic state. She has some horrid examples of people’s and organisation’s accounts being cut off with zero due process for alleged terms-of-service-infringing behaviour. I’ve written before about the use of police bodycams, mainly looking at what the first person perspective might mean for the way we will see (police) violence in the future. The ACLU has written an blog post about a video that clearly shows the level of manipulation that is possible for the police around their own footage. The third person viewpoint of a public surveillance camera made that clear in this particular case in point. Last year I wrote about “acting and directing with police body cameras” — how police officers are likely to increasingly learn to manipulate the photographic record that their cameras create. A stark case study in that kind of manipulation can be found in video of a 2014 arrest in Florida that was released in January and recently came to my attention. It’s the kind of video that everyone should watch in order to become sophisticated and properly skeptical consumers of video evidence. Update (d.d. 4 April 2016): The New York Times has put up an interactive site that allows you to see the same footage of standard policing situations from different points of view. Do check it out. The main lesson? 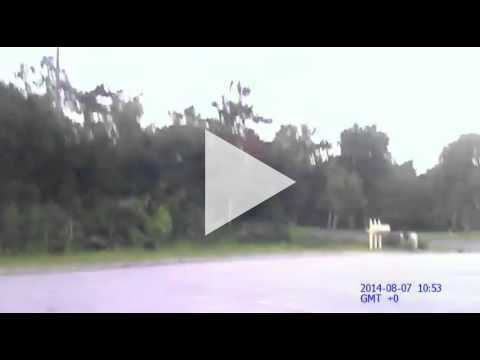 What we see in police footage tends to be shaped by what we already believe. About 4.5 years ago I wrote about me going to work for Shell. Now I am changing employer again. Starting today I will be the director of Bits of Freedom, a Dutch organization focusing on privacy and freedom of communication in the digital age. I’ve had a wonderful time at Shell: a steep learning curve, many opportunities for doing interesting projects in the learning technology and disruptive innovation fields, smart colleagues and enough scale and budget to try out big things. I wasn’t looking to leave, but couldn’t let this chance pass by. If you know me even a little, then you will understand that going to work for Bits of Freedom is very much a passionate choice. As somebody who understands and appreciates the positive potential of technology, I am deeply worried about the technology-mediated future we are currently creating for ourselves. I want to make an impact and change that for the better. I can’t imagine a place in the Netherlands that is more at the forefront on issues like surveillance, the EU privacy directive or net neutrality than Bits of Freedom. I am honoured that I get to work there for the next few years. Vlemmix deftly shows that many people in the Netherlands think they have “nothing to hide”, while living in a society which is increasing the level of control and eroding their privacy. Even though I follow this topic actively, the film still managed to upset me. I didn’t know that the trams in Rotterdam do facial recognition or that psychiatrists have to list the diagnosis of their patients in a centralized repository (see this Dutch article, and these Dutch sites of psychiatrists battling this DBC). Watching the film made me angry and worried. How much further before the police will start pro-actively arresting people for what they might do even before they do it, the infamous pre-crime?. The technology is already capable. It was interesting to see how Germany, with its Nazi and Stasi history, has much more awareness of the dangers of storing too much data. They refuse to implement the EU’s data retention policy for example. As you can see, there is ample need for a strong Dutch voice protecting your privacy. Bits of Freedom is doing a great job defending your digital rights. They could really use your donation. Slightly over a year ago, I had a conversation with Erik Duval about privacy in this digital world. He basically argued that losing privacy is not a problem as long as the transparency is symmetric. This is basically the point that David Brin writes about in The Transparent Society. The conversation started my thinking on this topic. Was Bill Joy right when he allegedly said “Privacy is dead, get over it”? 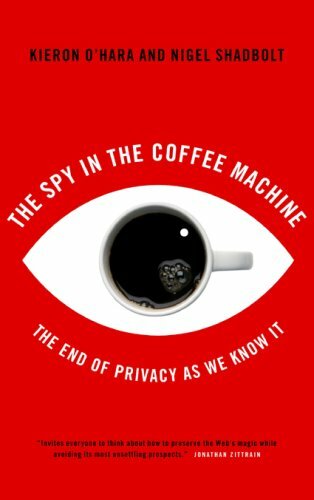 I was hoping that O’hara and Shadbolt’s The Spy in the Coffee Machine would give me some new perspectives on this issue. The book opens with a chapter on the “disappearing body”. We have less and less face-to-face contact and more and more phone, email and Internet (IM, (micro)blogs, social networks) communications. A physical presence leaves behind few signs, whereas information is persistent. When the prophetic but currently unfashionable Marshall McLuhan predicted that we would soon be living in a global village thanks to new technologies and media, most people took that to mean that travel would be straightforward, intermingling of diverse cultures frequent and influences wide and strong. But one other property of a village is the absence of anonymity and secrecy. Privacy is at a premium, and that is another aspect of the global village with which we will have to come to terms. But on the other hand, many use new technologies to expose themselves to view to a previously unimaginable degree. Webcams and Big Brother provide almost unlimited access to some exhibitionists, while very few people will pass up the opportunity to appear on television. […] Most academics would kill to be interviewed about their work, even as they cling to the copyrights of their unread articles. The amount of information that an ordinary person can generate, and store, is now colossal. It is possible to store digital versions of life’s memories in increasing quantities. As human-computer interaction specialist Alan Dix one playfully noted, it takes 100 kilobits/second to get high quality audio and video. If we imagine someone with a camera strapped to his or her head for 70 years, that will generate video requiring something of the order of 27.5 terabytes of storage, or about 450 60gb iPods. And if Moore’s law continues to hold for the next 20 years or so [..] we could store a continuous record of a life on a device the size of a sugar cube. The ability to record memories, and store them indefinitely in digital form in virtually unlimited quantities has been dubbed the phenomenon of memories for life. This is an important area of interdisciplinary research; we will need to understand how it will affect our social and political lives, and our psychological memories. In a clever demonstration of the dangers of mashups, consultant Tom Owad mashed up book wishlists published on Amazon with Google Earth, but with a twist. The Amazon users leave a name and a home town, which was often enough to locate them via Yahoo! People Search, at an individual address, of which Google Earth would hold a detailed satellite image. He also filtered out most of the books, to leave only those who read subversive literature. The result was a map of the world with readers of subversive books located upon it; click on the location of such a reader, and get a high resolution satellite image of his or her house. Of course, Owad was merely demonstrating the principle, not building a usable system for genuine deployment by the Thought Police. But …. There are also technologies that could help in keeping us empowered. The Platform for Privacy Preferences (P3P) Project for example “enables Websites to express their privacy practices in a standard format that can be retrieved automatically and interpreted easily by user agents”. The struggle for personal space between the individual and the community takes place on a number of fronts, and we should not expect sweeping victories for either side. There will be small advances here, mini-retreats there. In the background, the astonishing progress of technology will keep changing the context. The production quality of the film is incredible and the special effects are great. The final message of the film makes sense: stay aware. However, I found the tone too fear mongering and paternalistic. It made me averse to the video and left a sour taste in my mouth. Where is the constructive look towards the future? For me this post about privacy is an unfinished conversation. There are lots of things to think about and I guess we should keep paying attention. Privacy will be one the many sociological concepts which will get a completely different meaning over the next decades. What are your thoughts on this topic?